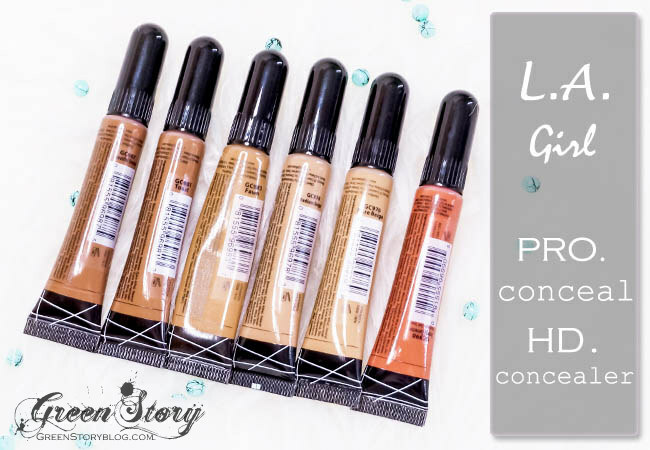 So, LA Girl PRO Conceal HD Concealer, probably the most raved budget concealer so far! They have 24 shades in their range including three (Orange, Green, and Yellow) corrector. You are probably aware of current cream contouring trend (or madness!? 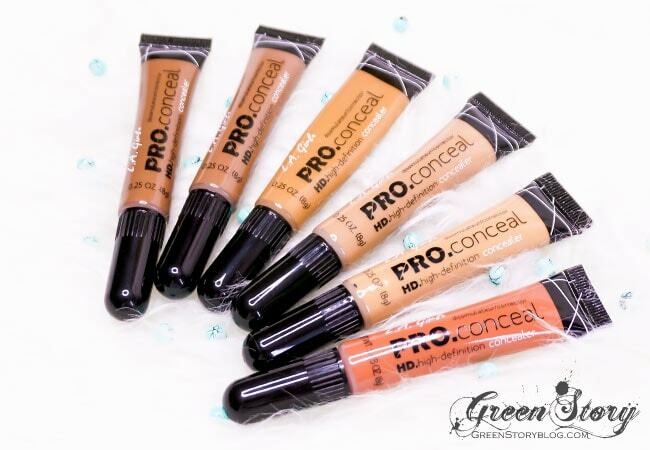 ), especially for that LA Girl PRO Conceal HD Concealers are more popular also because of their pocket-friendly price and huge shade range. If you haven’t experienced them yet then you must be wondering how they perform? Well, I’m coming to that point soon. 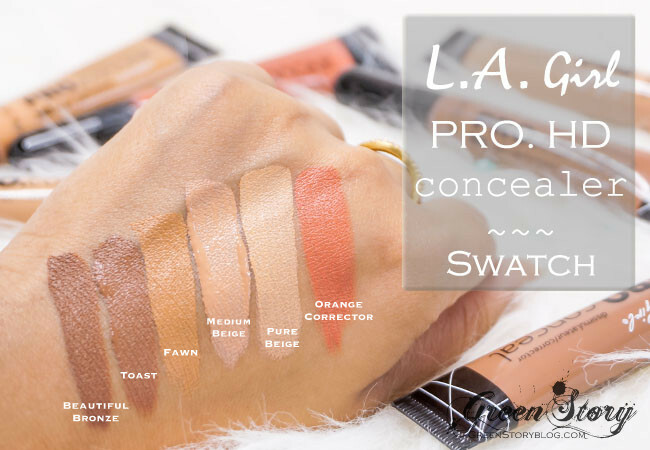 I picked up six shade of LA Girl PRO Conceal HD Concealer including one corrector (orange) for myself. Why I got six? Well, as because I bought online so it wasn’t really easy to pick a perfect shade and I wanted to try darker shades for cream contouring (so obvious!) as well. LA Girl PRO Conceal HD Concealer comes in a basic plastic squeeze tube with 8g of product and the tube has brush applicator as product dispenser. I actually like how nicely it dispenses the right amount of product, it is actually very much controllable. However, I don’t really like to use the brush directly, it doesn’t feel hygienic. The product itself is fragrance-free, thick and creamy in consistency, easily bendable and little goes a long way. I’m absolutely amused by the pigmentation and smoothness of Beautiful Bronze, Toast, and Fawn; I feel Medium Beige and Pure Beige aren’t consistent enough as like others. They all are lightweight and long wearing but neither gives full coverage nor crease resistant ( when you have fine lines under your eye). I know many people compare these concealers with MAC Prolong Wear concealer but I totally disagree with that. Yes LA Girl PRO Conceal HD Concealer does give heavy coverage but that is not that level of full coverage. Moreover, the staying power MAC Prolong Wear concealer has it’s nothing compared to that. Nonetheless, they aren’t bad at all, actually way better than any other drugstore concealer I’ve used so far. Beautiful Bronze and Toast almost looks similar in the picture, they are close shade in real as well but Toast has a more warm tone in it and Beautiful Bronze has a more red hue. Fawn is a pretty warm shade with an orange hue and quite darker than my skin tone. Medium Beige has rose-tone in it and Pure Beige is on the warm side. Because of rosy undertone, Medium Beige doesn’t really go with my warm skin tone. I found Pure Beige as my perfect under-eye highlighter for its warm tone. Orange Corrector has pretty strong red hue in it and it gets darker once applied. Pigmentation of this corrector is insane and you just need a little amount. I tried to show some shade comparison in the picture above. There is MAC Prolong Wear foundation in NC40, MAC Studio Fix Fluid in NC42, MAC Prolong Wear concealer in NC35, Urban Decay Naked Skin concealer in Med-Dark and Bourjois Healthy Mix concealer in Dark Radiance (53). 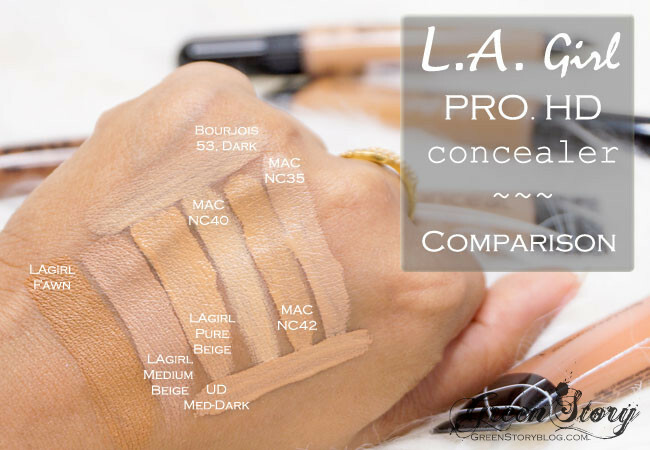 I know many of you order LA Girl PRO Conceal HD Concealer online and get confused to find your perfect shade. Hope that helps you. 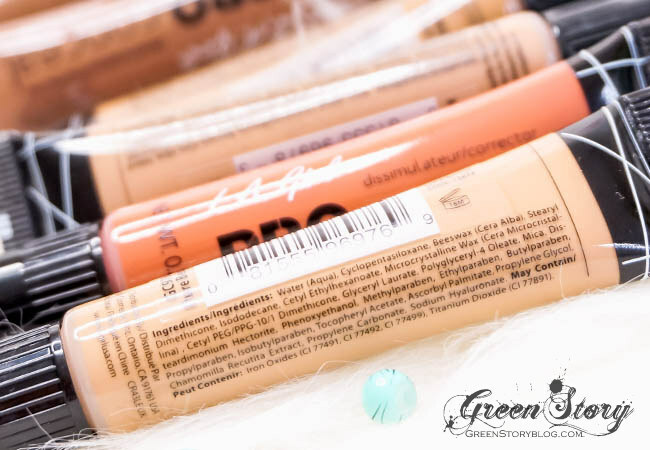 In a nutshell, LA Girl PRO Conceal HD Concealers are defiantly a good choice for its decent quality and a pocket-friendly price. Its larger variety of shade range is obviously a plus point and they do worth a try. They are available in L.A. Girl website, MorpheBrushes website, Walgreens, eBay etc. I have this in the shade pure beige, which matches me perfectly. From your swatches it looks like pure beige matches mac nc42. I want to try Mac studio fix fluid so does that mean nc42 would be my shade as well? It’s hard to determine, but i guess it will be nc42. Oh wow! I would definitely love to try these..
24 shade options is a great variation that allows one to get more than a perfect match. I should look out for this brand, but i dont think its available in my country. I like the applicator with this concealer, the colours look pretty nice too. Thanks! Wow what a selection of concealer shades! I’ve been seeing this brand lately but never tried any of their products yet. It’s just a shame that there’s so much preservatives in this product though :( otherwise I would have tried it. I totally agree with you Donah! They do contain preservatives yet I’ve poor knowledge on the chemical formulation! L.A. Girl products are not available in my country, but I’ve heard of the brand before. I would love to try the concealers. I am so excited to buy the orange corrector from this range as I have allergy issues and I have pretty bad dark circles. its been so long time i wanna buy this. its very good to contouring and shading based foundation. wow, you picked up so many shades of concealer! i wanted to try them out but the applicator tip kind of put me off…..
yes, i heard that this brand is really popular! So many range of colours to choose from, I’m sure can find one suitable for my skin type! i woul love to try and is affordable too..Thanks for the swatches ! I have heard of this brand before. I would like to try this concealer for my under eye area.